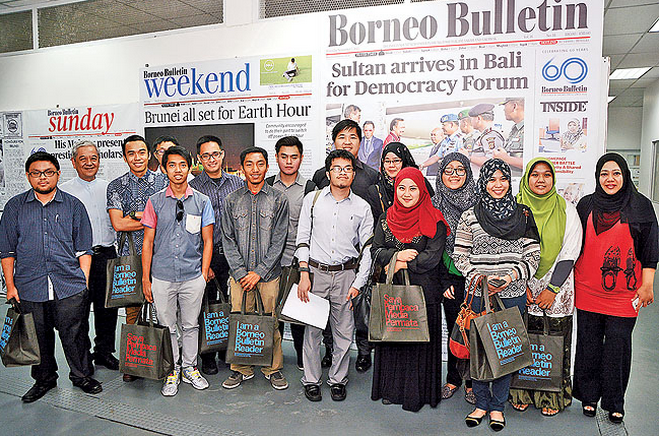 FIFTEEN undergraduate students from Universiti Brunei Darussalam, under the Faculty of Science and School of Business and Economics, yesterday got a taste of the media life during a study visit to Brunei Press Sdn Bhd – the publisher of independent newspapers Borneo Bulletin and Media Permata. The students are currently taking Corporate Communications module. During a roundtable briefing with Brunei Press General Manager Reggie See, Deputy General Manager Hazizah Osman and senior editorial members of Borneo Bulletin, the students learnt about the long history and round-the-clock operation of Borneo Bulletin. According to Lecturer Dr Annie Dayani binti Haji Ahad, who led the group, the visit aimed to enhance knowledge and furnish the students with practical experience particularly in the field of corporate communication and guidelines to writing press release and articles. The visiting group acquired a wealth of valuable information on the history of Brunei Press and its evolving publications of the Bulletin, as well as the operations and process behind the Bulletin’s publications, guidelines to writing news reports, tasks and responsibilities of editors, as well as career opportunities at Brunei Press. Ninety per cent of the Brunei Press workforce are local.